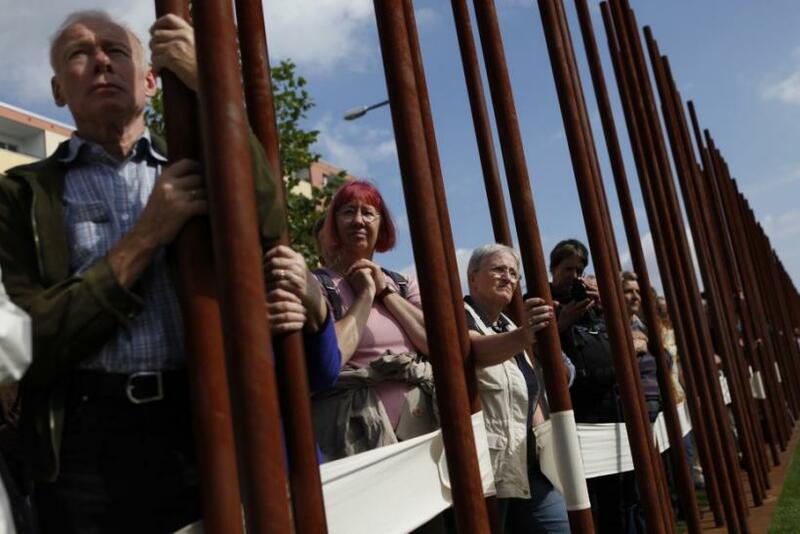 Berlin's mayor said on Saturday he was appalled that some Germans were nostalgic for the Berlin Wall and supported a newly fashionable leftist view that there were legitimate reasons for building it in 1961. At a somber ceremony marking the 50th anniversary of the Berlin Wall's construction, Mayor Klaus Wowereit, Chancellor Angela Merkel and President Christian Wulff paid tribute to the 136 people killed trying to get over the Wall to West Berlin. Wowereit said the Wall, toppled in 1989, should serve as a reminder of freedom and democracy around the world. Church bells peeled while trains and traffic came to a standstill at noon across Berlin for a moment of silence for the victims. 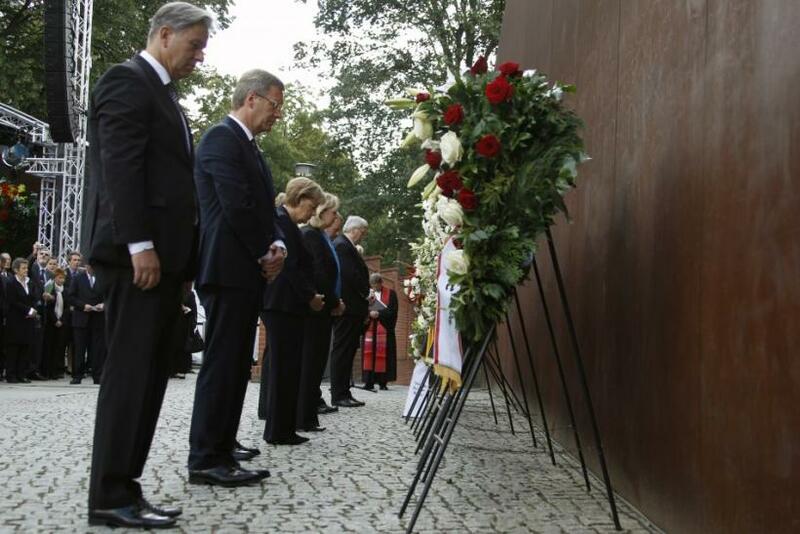 "We don't have any tolerance for those who nostalgically distort the history of the Berlin Wall and Germany's division," Wowereit said at the ceremony in front of a small section of the Wall recently rebuilt for posterity. "The Wall was part of a dictatorship," he said. "And it's alarming that even today some people argue there were good reasons to build the Wall. No! 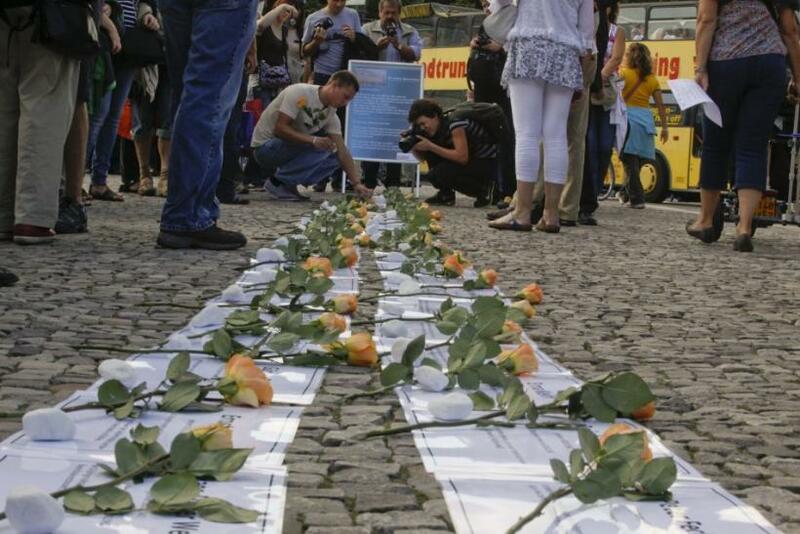 There's no legitimate reason nor justification for violating human rights and for killings." Most of the 160-km (100-mile) Wall encircling West Berlin in the heart of Communist East Germany was quickly torn down or chiseled away in the euphoria of 1989. There were only a few remnants of the 3.6-meter-high Wall left when Germany reunited less than a year later. Now, as growing numbers of tourists come to Berlin each year searching largely in vain for traces of the Wall, the city has re-erected and restored parts. New buildings have gone up on many parts of the former "death strip" and it is sometimes hard to tell where the barrier once stood. Saturday's ceremony was held at an 800-meter-long piece of the Wall complex on Bernauer Strasse that has been rebuilt. It was the scene of some dramatic escapes after the Wall was built. People jumped from upper storey windows in buildings on the east side of the Wall to the street on the west. The windows were soon sealed off and the buildings were later demolished. The shock over the construction of the Berlin Wall in August 1961 is still palpable half a century later. "We couldn't believe it happened and we all felt numb when we first saw the Wall," said Harry Dieter, 80, a retired West Berlin city official who was on his honeymoon in Italy when the Wall was built but returned a few days later to see it. "No one ever thought they would do that," he added. "I remember looking at the barbed wire and the cement and hoping that it wouldn't take long for someone to order it taken down. Unfortunately, the order never came." He and his wife Doris have recently celebrated their 50th wedding anniversary. "It's obviously better that Berlin is Berlin again and we're no longer divided by a Wall," said Doris Dieter, 72. "But unfortunately there is still a bit of an invisible 'Wall' in some people's minds that I fear will last for quite a while."